We can tailor your package to whatever level you require, from bacon sandwiches on arrival to full breakfast and champagne. You may wish to bring your clients to the tranquil valley to get away from the pressures of business or you may be looking to have a team-building day with your employees. Whatever your needs we are here to listen and come up with an exclusive package that you will be delighted with and that your guests will never forget. After your breakfast in Bellbrook Lodge your Instructor will then give you an introductory talk outlining the day’s activities covering the equipment, safety and basic techniques. You will also learn all about the rod, reel, fly line and flies, how to set it up, which casts to use, useful knots, fly life, the fish themselves and even safety at the waters edge. There are of course ample photo opportunities, which we can assist with if required, simply let us know when booking. In the middle of the day, what better than a homemade meal back in the Lodge providing ample opportunity to find out who caught the largest fish and to swap stories about "the one that got away". Menus tend to depend on the time of year but typical winter fare would include something like Bangers and Mash (local produce of course) followed by Homemade Bread & Butter Pudding. During the summer we can fire up the BBQ and offer a range of salads etc. We are open for general Fly Fishing days all the year round when you can book any of the lakes or take over the whole complex for the day, according to your needs. Depending on numbers and requirements, we can tailor a day's activities to suit including tuition and equipment. We provide all the equipment, rods, flies and instruction needed to do battle with the lake's monsters, we have the finest instructors to guide you through the day and to help with pictures to capture the excitement. We can even arrange for a Fly Fishing celebrity to join you. 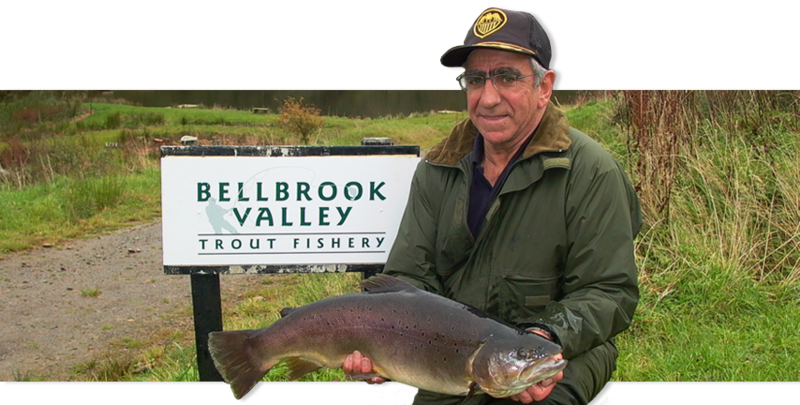 Our 'Big Fish' days run throughout the spring, early summer and Autumn months when fishing is generally at its best. Another popular day could be one of our "FEATHER AND FIN" days. These are held during the shooting season October through till January. Recently we catered for 15 top-level executives who were greeted with a hearty English breakfast with good coffee and a nip of something warming. They were then introduced to the Shoot Captain for a chat and to discuss the formalities of the day. This was then followed by the all important safety briefing. The number of birds shot depends on experience but the emphasis is on making sure everyone has a good day with some good quality sport rather than pure volume. The morning shoot was followed by a good three-course lunch held in the lodge where there is ample opportunity to spend further quality time with your guests. Once everyone was ready there was a relaxing afternoon of fishing. We had an instructor and a celebrity angler to speak at suppertime and award a few prizes including Best Improver and a few booby prizes as well. As with the Feather and Fin days except these take place all year round.